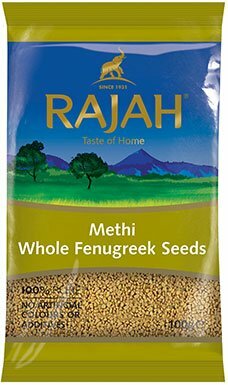 The amber-yellow seeds from the leafy fenugreek plant have been used across the world for thousands of years. Originally, the plant was known to be cultivated in the Middle East, although remains of the seeds dating back to 4000 BC have been found in Iraq and Egypt. The word fenugreek comes from the Latin word for ‘Greek hay’ since it was essentially used as fodder for cattle. While the leaves were mostly used in cooking, the seeds were also used for their medicinal purposes. Today, fenugreek seeds play a key role in many dishes across South Asian cuisines. Mostly whole but sometimes powdered, their bitter taste has immense therapeutic powers. Fenugreek is grown for its seeds and leaves in many countries such as Afghanistan, Pakistan, Iran, Nepal, and Argentina. However, the largest producer is India, where the desert state of Rajasthan alone yields 80% of the country’s fenugreek production. Fenugreek needs a sunny spot with well-drained soil to flourish. Once sown, the plant grows quickly and flowers to produce thin seed pods. Farmers allow the pods to ripen and turn yellow on the plant before harvesting the seeds that pop out of the pods. Fenugreek seeds are sharp, bitter, pungent legumes that are used as a spice. To enhance their aroma and nutty flavour, dry roast them on a medium flame until their colour deepens. Roast them lightly for a mellow flavour and longer for a bitter taste that works better in pickles. They can retain their flavour for years if stored unrefrigerated, in a tightly sealed container. The bitter fenugreek seed has several therapeutic powers. Due to its estrogen-like properties, fenugreek has been known historically to help increase libido. It also reduces the effect of hot flashes and mood fluctuations that are common symptoms of menopause and PMS. It is used to treat asthma and bronchitis, improve digestion and maintain a healthy metabolism. Many a nuskha (home remedies) have been administered with soaked fenugreek seeds to keep blood pressure under control.